Hello! Yes, I’ve been window shopping again. 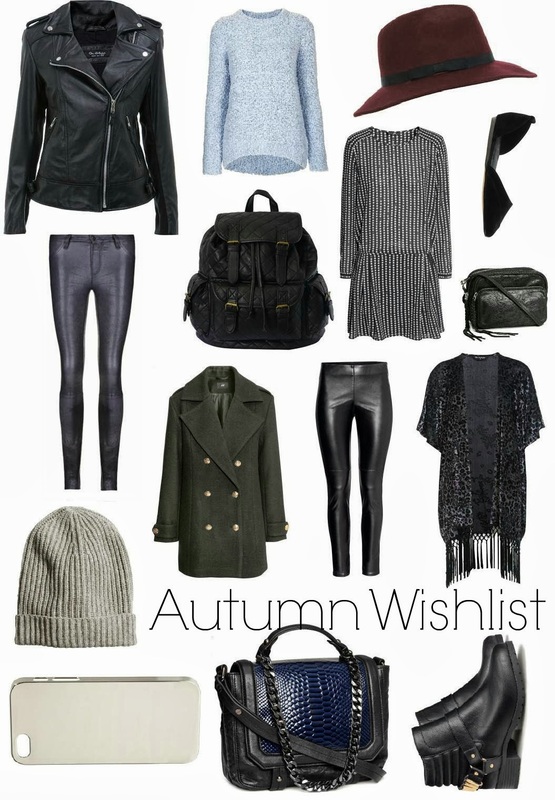 My Autumn/Winter wishlist seems to be revolving round the same cool tones of black, grey and navy with gold or silver hardware and simple shapes. Sort of Isabel Marant meets Zara meets Caroline Blomst meets oh good lord my bank balance. My favourite piece has got to be those H&M harness boots which I’ll definitely be ordering come payday (I’m skint until then as I may or may not have won some Acne Pistol boots on ebay, yayy), as they’re so nice! H&M have been throwing out some lovely pieces recently, including that pattered dress I originally saw in their catalogue and fell in love with. Same with that khaki coat and the blue snake bag. Four for you H&M, you go H&M. Leather is big on my list of loves right now, so I had to include one high end item in the form of those navy J Brand Jeans from Trilogy. How perfect are they? I can’t even image how soft they would be and I could only dream of getting my hands on a pair. Aside from all of that, I wish I suited hats. The fedora is oh so lovely, but they squish my fringe down and make me look silly. It would be my achievement of the year (not really but maybe) to find one I could wear that looks nice! First world problems, ey. What do you have your eye on this A/W? Let me know below! Oh and there’s 20% off all advertising packages, so book one now for October while there’s some left! Make sure you’ve entered my Chanel cream blush giveaway! ps. Check out these lovely blogs: given me wings, 739051 and toots!